Sightseeing in Western Brook Pond in Gros Morne National Park in Newfoundland Labrador is best done aboard one of the tour boats. A tour boat called West Brook II, travels slowly along the lake allowing passengers to enjoy their sightseeing trip to Western Brook Pond in Gros Morne National Park in Newfoundland Labrador. 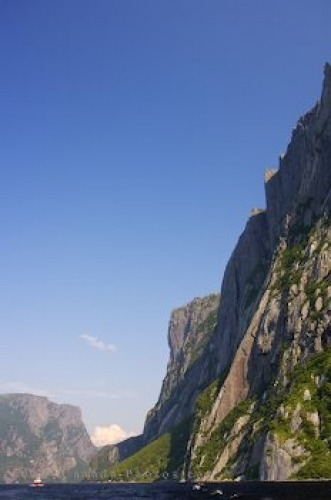 Sightseeing on the boat tours is the only way to feel the beauty and magnitude of Western Brook Pond and to feel the power of the waterfalls as they cascade over the 2000 foot high cliffs. Picture of a sightseeing boat tour on Western Brook Pond in Gros Morne National Park.